The Wands were created by the Aldruku as a weapon to finally destroy their Nyorian enemies. These wands appear as slender, leather-covered switches 3’ in length. The leather is dyed the color of dried blood and its length is enscribed with mystical runes. The Wands were created by the Aldruku people as a weapon to finally destroy their Nyorian enemies (See Nethernimbus for more details). The Aldruku priesthood were assisted by their deities (who were also warring against the Nyorian Pantheon) in developing these accursed items. The Wands are crafted from human bone,sinew and skin and infused with power both divine and from the slaying of human sacrifices. The wand’s power is simple, but dreadful. It will force the soul from a living being and tear it into fragments. Apart from causing the death of the victim, the now sundered spirit will be unable to proceed to the afterlife, as the components literally are scattered to the wind. With sufficient divine magic - either directly wielded by a deity, or by a sufficiently strong priest, one can attempt to reunite the fragments, but they must be found and brought close together first. Depending on the strength of the sundered spirit, the fragments may manifest themselves as non-corporeal undead of minor power. Destruction of these Fragments will cause permanent damage to the soul should the remaining fragments be collected and united. The power level of these items is quite high, and in the World of Neyathis, quite a number were created by the Aldruku. However, with the destruction of their fleet, the wands were virtually all cast into the sea and carried by tides to all ends of the world. Some were destroyed by the effects of weather, or through misadventure through the centuries, but some still remain. The undead spawned through use of these could alert various groups that one of these rods has been uncovered. Their macabre origin and intense evil lends them to having dangerous side effects to the bearer. That which so readily destroys spirits might do so also to its bearer, perhaps slowly slicing away pieces of his spirit, creating additional Fragments. The Aldruku never found out about this side effect - they having created the rods only a short period before their one and only use. A powerful empire, macabre and violent. Now gone, a victim of their own folly. The Aldruku Empire - an empire woven from tribal clans and bound by the powers of their shamans. Bloody and warlike, they continually lashed against their neighbors. It was they who helped shatter the Hanaset empire. And their final war was that against the Nyorians. In their bid to destroy their most hated enemy, they wrought their own doom and created the horror known as Nethernimbus. The Aldruku are a bronze-age society embroiled in sorcery. Hailing from tropical coastlines they are excellent sailors and build ships similar to Viking longboats. They were a violent people prone to head hunting, slavery and cannibalism. The Aldruku have no central leader - the nation is led by hundreds of tribal shamans who coordinate over distance via magical rituals. The shamans are advised by their gods through visions. The Aldruku were some of the greatest necromancers of the Ancient world. They created many amulets of power and their skill reached it’s zenith with the Wands of Soul Rending. These weapons enabled the destruction of the Nygorian High Fleet, and brought about the fall of both Nygoria and Aldruku. The Aldruku use body paint and tatoos, along with mutilations to create horrifying appearances. Shamans tend to paint themselves to resemble skeletons. Upon their heads, the shamans wear skullcaps fabricated from human skin - taken from fallen enemies. Their Warriors would typically carry trophies of slain victims, such as shrunken heads or fingers. Armor is generally leather reinforced by bone. This leather is generally made from the hides of wild boars or sharks. The Aldruku build longboats of all sizes, from single-person to large ships of war. Their ships are built with cobra-like prows and serpentine imagery is used throughout. Their paddles are carved to appear as cobras - the blade of the paddle shaped like a cobra’s hood. The Aldruku are nearly extinct as a people. 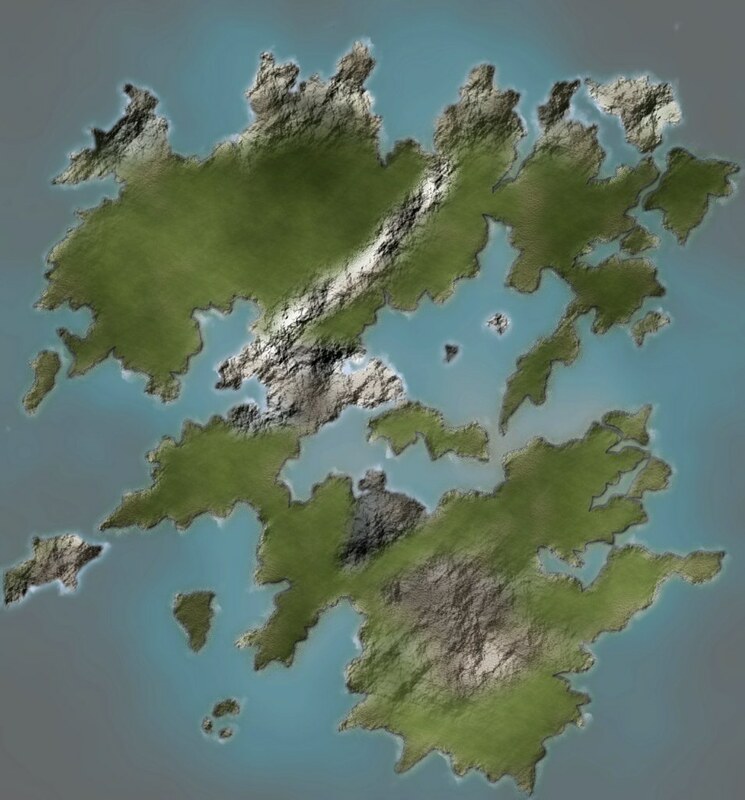 There are a few isolated islands harboring dwindling and terribly inbred pockets of Aldruku, along with small enclaves in other kingdoms. They have, however, left a dark and dangerous legacy in their large number of necromantic amulets. These talismans, generally crafted from human bone and either bleached white or dyed night black, are repositories of necromantic energies to be drawn upon by unprincipled magii. While useful to the powerful and skilled, they are occupied by bound dread spirits who will seek to take over weaker users, spurring them to even greater acts of evil and depravity then they may already be prone to. It was as if mother nature herself knew of the tempest that was about to unfold. The clouds hung heavy and dark in the skies, and a brisk wind dotted the seas with foam. The song of the wind was accompanied by the creaking of wood and the sounds of thousands of oars being rowed as fleets of galleys closed on each other. The fleet coming out of the north was of dozens of long, low open-air gallies with Cobra-headed prows. Each ship bore 40 pairs of oars, and each oar pulled by two stout warriors bearing the ornate leather armor and skullcaps of the Aldruku empire. Standing at the prow of each ship was the distinct figure of an Aldruku Shaman, painted with chalk and charcoal to resemble a grinning skeleton. Each grasped an unusually long wand with the color of dried blood. Around their necks hung necklaces of shrunken heads and other unsavory talismans. Arrayed against them was the Nyoran armada. Their ships were also galleys, huge well-built triremes with massive, totem-pole like prows adorned with dozens of scowling demon-heads. The main decks of the Nyoran ships were crowded by marines, some in metal armor, and many armed with powerful bone and horn shortbows. The Nyoran fleet outnumbered the Aldruku fleet and to the Nyoran commanders, the outcome of this battle was a forgone conclusions. Finally the foul Aldruku was meeting them in a proper sea battle! Finally they would no longer raid their lands! They were right, but not in the way that they hoped. As the two fleets closed to bow range, the Aldruku shamans began to chant, and from their lead vessels, beams of sickly yellow light erupted and played across the vanguard of the Nyoran fleet. Over the tops of the affected ships could be seen puffs of what appeared to be black smoke. As each ship was caught, any and all who were struck by the yellow beam was thrown to the deck, contorting in pain. A moment later their spirit was torn from their body, emerging from their mouths and eyes as black smoke and flew upwards. Had the Nyorans themselves been any less foul a people then the Aldruku the outcome may have been different, but they were, and so the torn, shattered souls which drifted in the sky over the massacre below, began to combine. The mass of dark souls combined and bound themselves into the turbulent skies above. Even in their torn state, however, one emotion served to unite them, to form into a single, malevolent group mind. Hate. The slaughter continued - those Nyoran ships which saw the oars of the lead ships suddenly cease after the beams struck quickly understood that they meant death, and so the fleet fell into disorder, as the individual Captains attempting to flee. The confusion led to collisions and the Aldruku fleet pressed forward, their shamans slaying all ships whose oars moved. One Nyoran ship carried on through and delivered the only answering blow of the battle. The Lykhan , the Nyoran fleet flagship, was rowed by several hundred undead, and those already dead were not subject to the soul-rendering magic of the Aldruku. This ship, its human crew lost to soul-rending, carried on it’s course and this brought it into the Aldruku fleet, where it rammed and sunk one of their small galleys. The Lykhan carried on and out to open sea, never to be seen again. Once the Nyorans were all slain, the Aldruku ships began to come along side the now silent Nyoran ships, to take possession and loot them. The sky above hung ominously, but the greed of the Aldruku overrode any concerns they might have had about the weather. The wind then picked up and acquired an unusually cold, disquieting edge to it, and as it gained strength, some of the Aldruku said it sounded like voices. The wind grew from strong gusts to a full blown gale and the Aldruku became alarmed - never had they seen weather change so suddenly! Frantically they began to re-board their own ships - they could not hope to properly navigate the Nyoran ships, so much larger and being of an unfamiliar design. The winds grew still stronger and colder and the Aldruku fleet was thrown into turmoil. Finally the storm reached its full power and the winds blew with hurricane force, causing the low Aldruku vessels to flounder. Worse still then the power of the winds, was the unearthly cold touch that the winds brought. Sailors frantically tried to row their ships but found their hands numbed and their muscles failed. Those in the water perished quickly, either to drowning, being dashed by ship and debris, or the killing cold which stopped their hearts. None of the Aldruku ships survived the destruction the storm brought. The storm, now guided by a faint intelligence, realized that it had no further victims. Still bound by hate, it knew where the lands of it’s enemy was, and so moved up the coast to the Aldruku homeland. Where ever the storm made landfall, any not protected by four good stone walls and a sturdy roof, perished. Plant, animal,insect and man all died as the dreadful storm carried on. The Aldruku capital and many of its other principle cities fell into the storms paths, and were destroyed more completely then even the upcoming atrocities of the Dire Wars. The Gods of the Aldruku were shocked by the destruction being vested upon their peoples, and strove to stop this destruction. For without their people, their power would be diminished. Even the power of the weakened pantheon was unable to destroy this storm, now termed Nethernimbus by the few survivors, but they were able to direct the storm to an isolated island several days sail west of the devastated Aldruku coastline. There the storm was bound by the gods, held in place by a set of powerfully enchanted ward-stones. The storm remains there still - a manifestation of hate and of man’s inhumanity to man. None who have approached the island have returned, for the winds have lost none of their power, and these winds have the touch of wraiths! Nethernimbus is a vast, semi-intelligent hurricane with black and sickly yellow-streaked clouds. Nethernimbus has acquired somewhat greater intellect over time - it is not fully conscious yet and should it do so, it may in fact manifest itself as a deity. It rages continuously against the magical chains that bind it, chains which are maintained only by the continued existence of a handful of Aldruku shamans revering the old Aldruku gods. This is a tenuous existence, as the few Aldruku shamans are old and constantly hunted by a few remains of the Nyoran people, a feud which has existed now for millennia. If released, Nethernimbus will find few Aldruku to destroy and will likely being to ravage other enemies. This is not a subtle addition to a campaign. To deal with it effectively would require Divine level power. This storm, if released, can be used to completely change entire nations, ala the Black Plague. The size of this storm should be tailored to the desired intent. Perhaps it is never released, but the PC’s need to act to stop a doomsday group that may choose to. One possibility is that so long as any of the Wands of Soul Rending (The devices used by the Aldruku Shamans) still exist, then the storm will persist. If all of the Wands are destroyed, then the storm will dissipate and the spirits released. A powerful, maritime people, brought down by the foulest Necromancy. The long-time enemy of the Aldraku, their kingdom was shattered after a terrible defeat by their enemy. Once their strength was shattered, their many subject peoples rose up and exterminated them as part of the Dire Wars. The Nyorians were a powerful, iron-age people with a large empire. They held this empire with a great fleet of wooden triremes backed up by well armed marines. Numerous other peoples paid homage to the Nyorians, typically offering up their young people as slaves and concubines. The Nyorians held congress with beings of the nether realms, worshipping Demons along with the spirits of their forefathers. They dabbled also in the arts of Necromancy, but not to the level of their hated Aldraku foemen. The Dire Wars succeeded in removing the Nyorians from the world, completing the destruction the Aldraku started. The hatred the subject tribes held for the Nyorians was such that all structures of Nyorian make were cast down. Any such structures remained were buried by flood or volcano before their fall. Apart from legends and the occasional strange silver coin, virtually nothing remains of this people. The Nyorians were descended from people from northeast Terran africa and bear Egyptian and North-African remnants, though at their fall, they were at a late dark age/early middle-aged technology level. Iron and steel was used, ships were fairly seaworthy and weapons as complicated as arbalests were available. Religion was tied closely to their Egyptian ancestors, but the signficance of such details as the Nile river largely vanished. Their homelands did not contain any river close to the Nile in size or cultural signficance. The Nyorians are closely related to the peoples of the more recent Helena-Thoth empire, whose peoples were much more successful over the millennia. The Nyorians developed a writing system that evolved from the hieroglyphics to a nearly pure Phonetic alphabet, though one that still strongly resembles its origins. Of course, no species of man can dwell upon the world and not mark it in some manner. Even the very through scourging by their enemies failed to destroy everything they built. Some items of great values remained intact, often as spoil retained by those who did not care as much about the origins of the item. After a couple of generations, there were few indeed who would even recognize an item as being of Nyorian origin. In truth, many items currently identified as of ‘ancient Helena-Thoth’ origin are actually even older relics of the Nyorians. Few if any could identify the difference, except perhaps those few Nyorian undead. Sadly, any current Nyorian Undead are so old that they are all mad as hatters. The greatest collection of Nyorian undead is the vast swarm of wraiths that is Nethernimbus, though the wards of the Ku! have so far held, preventing these from entering the world. A few other Nyorian spirits still walk the world, speaking their dead language and bearing the finery of their station. The practice of Necromancy was present in Nyorian magic, but was eclipsed by their use of demonic magics. Having been dead and gone for millennia, no corporeal Nyorian undead are known to exist - all of long since crumbled to dust - and the few non-corporeal undead are almost all terribly insane. As a dead people, they are little more then backstory, the creators of ruins and odd artifacts. Legends have grown over the ages, and what tales exist of the lost people are exaggerated. Where they occasionally summoned demons, they became demon worshippers, where worshippers, they have become demons themselves. The world of Nayathis is the home of many of my Submissions. It is divided into several continents separated by wide seas, allowing for isolation and completely divergent developments. Neyathis - Principle continent of the world. Rephatia - Homeland of the insidious Rephatians, the twisters and devourers of humanity. Sagaris - Neyanthian Antartica, a huge southern continent locked in an eternal ice-age. This world is largely an earth-analog, but with smaller continents. Lifeforms are in most cases Earth analog with some divergences. A detailed history will be added later, but greatly shortened, the world has changed hands both divinely and physically several times, being dominated by different sets of divinity and life over the eons. Humanity and a dozen pantheons hold control now, but they are not the first and arrived here from elsewhere. Even once Humanity arrived, grand empires and civilizations have risen from bronze to nearly industrial ages several times and have come crashing to the ground again and again. A common theme is war and displacement, and the folly of man reaching too far and casting himself down into darkness. consider these stolen for AuR, but in whip form. Update: I think this can stand as a sub. Out Wit Ye! Ouch. I like the imagery of the item itself, but the power itself is a bit "meh". It's basically an instant-death rod, with the added side effect of being unable to resurrect the person afterwards without great difficulty. Though I will say that the soul-shard undead could make for a fairly interesting lot, if played correctly. Just an idea, but if I were to use these I would make the wand tear the soul from the mortal and manifest it as a sort of physical object -- perhaps a crystal or a glass globe. The attacker could then do with the soul what he wishes. He could shatter it into a hundred pieces and scatter them to the four corners of the world (good backstory for a campaign), or he could simply be a sicko who collects souls and keeps them in a room somewhere. Maybe he fancies himself to be a sort of god -- perhaps he even has a cult following whose souls he "harvests". solid, nice visuals, did you envision having to touch the target with the wand. The final confrontation was apocalyptic for the cultures involved, so ranged fits. They were meant as a cause for things to have happened - e.g Necronimbus - and as an extremely rare uberweapon. By late afternoon, the sky starts to cloud over. The sun shines behind the fluffy clouds, gilding the edges and showing a Jacob's-ladder of rays streaming through the gaps...very pretty. Gradually the clouds shift into a new configuration: you realize with awe-struck, preternatural clarity that the clouds form a map of a coast-line that you know against the blue sky as ocean: surely it's a Sign! Suddenly, the golden beams coalesce into one long ray that strikes across the blue. A star-like gleam flashes under the ray: perhaps it is an island? But the charts show no island there...who would want to hide an island? Who could do it?